A pitch for Cody Wilson’s downloadable firearms. You probably never heard his name before today, but Cody Wilson emerged this week as an influence in the Connecticut primaries for governor and attorney general: He is a self-described “crypto-anarchist” from Texas who wants to sell America a downloadable blueprint for the 3D printing of untraceable plastic firearms. In a state where there seemed to be no more frontiers in the world of gun control, Wilson has enabled Democrats to go on the offensive on guns — and even enticed Susan Hatfield, a Republican candidate for attorney general backed by the state’s largest gun-owners’ group, to endorse legal action to stop him. Guns and Donald J. Trump are the ultimate wedge issues for Democrats, and Cody Wilson’s 3D-printed gun has tied them into one neat package. The Obama administration used laws banning the foreign distribution of firearms to stop Wilson from posting the blueprints on the web, but the Trump administration lifted the ban last month. 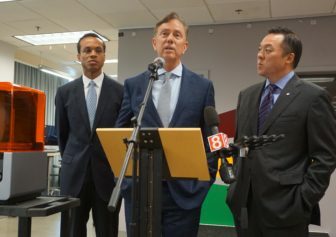 Lamont spoke Wednesday at the Hartford Public Library, standing by a 3D printer with two other endorsed Democrats facing primaries: William Tong for attorney general and Shawn Wooden for state treasurer. Tong and his two rivals for the nomination, Chris Mattei and Paul Doyle, already had made fighting Trump and the NRA central to their campaigns. From left, a 3D printer, Shawn Wooden, Ned Lamont and William Tong. Tong’s first commercial opens with an image of Charlton Heston holding a rifle at an NRA convention, eventually turning to Trump. Mattei’s first commercial opens with a picture of Trump. Both Democrats vow to fight his administration as attorney general — as Attorney General George Jepsen, who is not seeking re-election, is doing now. Connecticut is one of eight states that filed suit in federal court against the Trump administration over its action, accusing it of making “an under-the-radar settlement” with Wilson’s company, Defense Distributed. The company had been planning to post the blueprints Wednesday until a federal judge granted the states’ motion for a temporary injunction. Wooden, who lost a cousin to gun violence, briefly choked with emotion Wednesday when answering a question about where he, Tong and Lamont think the issue ranks in the interest of voters based their interactions with voters and polling. Tong, a state representative from Stamford, is the co-chair of the legislature’s Judiciary Committee, as is one of his competitors, Sen. Paul Doyle of Wethersfield. Doyle had called for Connecticut’s intervention in the case. In a Democratic primary, running against the NRA is good politics. The legislature passed a law this year banning bump stocks, the accessory used by the Las Vegas mass shooter that effectively turned semiautomatic rifles into machine guns. But legislation addressing 3D-printed firearms and “ghost guns,” firearms that can be assembled from mail-order kits, never came to a vote. Lamont said he would press for the legislation next year if elected. The issue of 3D-printed guns is a delicate one for Republicans. In a crowded primary like the five-way contest for the GOP gubernatorial nomination, gun owners are seen by several campaigns as an important, if not potentially decisive, demographic. Timothy Herbst and Bob Stefanowski, two of the GOP’s gubernatorial contenders, quickly publicized the NRA giving them its highest grade. Herbst also is endorsed by the Connecticut Citizens Defense League, the state’s biggest gun-owners’ group. Both say they would oppose further gun-control laws in Connecticut. Hatfield, a Trump delegate to the Republican National Convention and the GOP-endorsed candidate for attorney general, seized on Trump’s tweet, saying the issue is not a partisan one. Stefanowski did not answer when asked his position on 3D-printed guns. Herbst did not return a call for comment.